← What’s the application of aluminium diamond tread plate on stair steps? With the widespread use of aluminum products, aluminum circle product can be seen in many aspects of our lives. Many companies began to produce aluminum discs, so as to meet the needs of the market. If a manufacturer want to standing out of the market, the quality ofaluminum circle is the first considered key problem. Only qualified products can track customers and won high reputation, and takes success of the career. While processing thealuminum circle, there are some notes should be considered, with years manufacture experience, Haomei aluminum summarize the notes, now we will share them to you. Firstly, the size of the aluminum circle in the cold rolling process must be accurate. The length and width must meet the requirements of customers, try the best to control the diagonal tolerance between 1-2mm. Secondly, the most common problem in the production process is the phenomenon of scratches, so when the production of aluminum circles, in the process of rolling there will be friction with the shearing machine feed mouth, there are scratches affect the appearance, if the customers’ requirements of the surface quality are very high, it is recommended to roll after the coating process, but the cost may be higher. Thirdly, in the production process there may occur the shear knife is not sharp phenomenon which led to the edge of the aluminum circle is not neat, for these problems, we proposed to use new processing equipment or go to large-scale processing enterprises for production. Haomei Aluminium is both a aluminium Circle manufacturer and supplier with 18 years experience. So factory price is available, we are professional in producing aluminium circles.aluminium Round sheet, another name is aluminum disc. It is aluminium sheet in round shape. 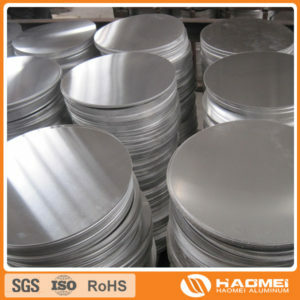 Pure Aluminium Circle, like Alloy 1050, 1060, 1070, 1100 and Alloy Aluminium Circle, like Alloy 3003.
haomei aluminium circle is widely used in making aluminium cookware, as aluminium sauce pan, pizza pan, utensils, and various other applications, like: traffic signs, furniture, lighting, lampshade, etc. This entry was posted in Aluminium circle and tagged aluminum circle. Bookmark the permalink.